Humans may be able to replace parts of the skin or liver when injured, but we have a limited capacity to regenerate many other complex structures as adults, such as limbs or brain tissue. The explanation for this is complicated, and many aspects remain poorly understood. To understand how complex structures might be reconstructed in adulthood, scientists often turn to organisms that maintain the ability to regenerate appendages, like salamanders or zebrafish. However, lizards are one of the closest relatives to mammals capable of regenerating complex, multi-tissue structures as adults. Lizards will self-amputate, or autotomize, their tails when threatened and regrow a semi-functional replacement, a process that remains largely enigmatic. 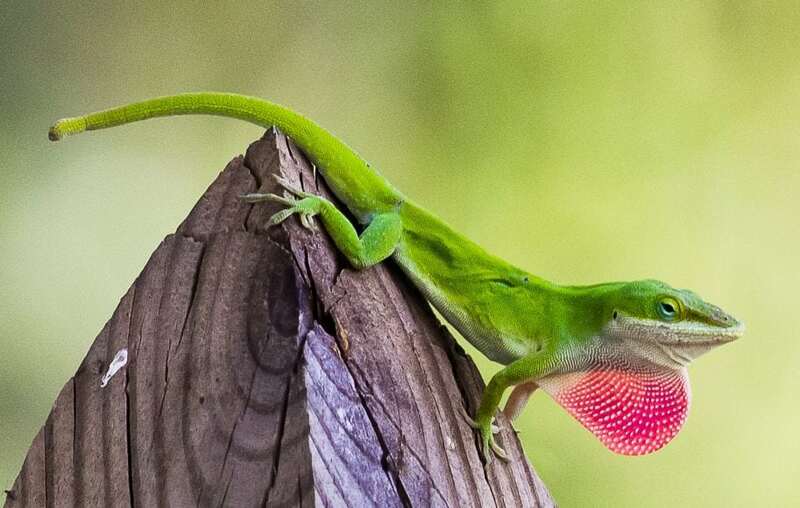 At Arizona State University, a team of researchers is studying how the green anole lizard, Anolis carolinensis, accomplishes this feat by examining the regeneration of the neuromuscular system in the tail. The restoration of the interaction between muscle fibers and nerves that control muscle contraction is critical for lizard tail function. Mammals can typically regenerate peripheral nerves following injury but are unable to restore large volumes of muscle. Remarkably, lizards regenerate entire muscle groups in addition to peripheral nerves, cartilage, vasculature, and skin. The initial development of the neuromuscular system has been well defined, yet, the dynamics of neuromuscular regeneration in adulthood are less clear. Neuromuscular junction (NMJ) formation begins early in development in a process dependent upon reciprocal interactions between spinal motor neuron axons and muscle. Target muscle fibers are initially contacted by multiple motor neuron axons, which induce the clustering of neurotransmitter receptors on the muscle surface necessary for synaptic function. As development proceeds, axons are pruned back so that a single mature NMJ on a muscle fiber is innervated by a single motor neuron. The initial phases of lizard tail regeneration are thought to recapitulate development but in an environment quite different from the embryo. Past gene expression profiling efforts identified the reactivation of key developmental signaling genes and microRNAs. However, it is clear genetic programs unique to the adult are activated too. This combinatorial model raises fundamental questions regarding how neuromuscular regeneration might differ from development. Do regrowing nerves differ in their innervation pattern of newly regenerated muscle? Is the reduced function of the regenerated lizard tail due to alterations in NMJ reformation? To answer these questions, scientists at Arizona State University examined the time course of neuromuscular regeneration in the green anole lizard tail. The researchers visualized the distribution and presence of tissue-specific proteins using fluorescently tagged antibodies that label regrowing axons, muscle, and Schwann cells. Following autotomy, regenerating axons rapidly extend into the regeneration front and innervate muscle as soon as it begins to reform. Consistent with development, these axons are soon remyelinated by Schwann cells in proximal regions. Moreover, NMJs reform on regenerating muscle within days and acquire a normal morphological appearance over time. At later stages of tail regeneration, axons seem to undergo pruning, which is also critical for refining neuromuscular connectivity during development. However, scientists did note differences that are unique to regeneration in the adult. NMJs were found in abnormal locations relative to the original tail muscle at early stages of regeneration and were present at a higher density than original tails. The maturation of NMJ morphology occurred over an unexpectedly protracted period of time. Both axonal and NMJ density remain more numerous relative to the original tail after axonal pruning has occurred. These differences clearly indicate that neuromuscular regeneration only partially recapitulates development and raises many important questions about the adult regenerative context. Is the sustained increase in NMJ and axon density helping or limiting lizard tail mobility or function? Are neuron or muscle-derived cues directing this process? What is the role of the adult immune response in sculpting neuromuscular regeneration? Further study of nerve-muscle interactions in the regenerating lizard tail may provide valuable clues for promoting regeneration in humans. These findings are described in the article entitled Developmental and adult-specific processes contribute to de novo neuromuscular regeneration in the lizard tail, recently published in the journal Developmental Biology. This work was conducted by Minami A. Tokuyama, Cindy Xu, Jeanne Wilson-Rawls, Kenro Kusumi and Jason Newbern from Arizona State University, and Rebecca E. Fisher from the University of Arizona College of Medicine-Phoenix. Xu is a PhD candidate at Arizona State University. Jason Newbern is an assistant professor at Arizona State University | ASU · School of Life Sciences.